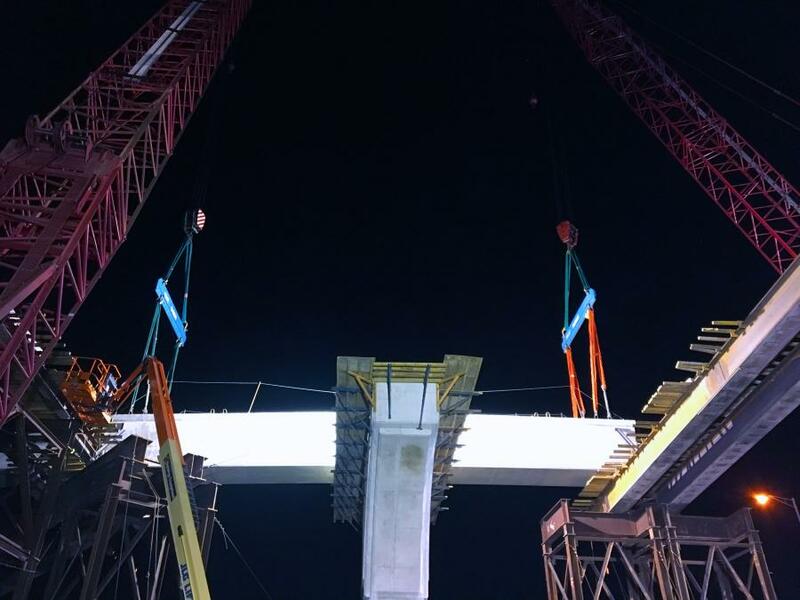 ALL Sunshine Crane Rental provided a matched pair of Manitowoc 2250 crawler cranes to perform the dual picks necessary to set the massive concrete U-beams that form the backbone of the new interchange. In the past decade, Orlando, Fla., has been in a near-constant state of road construction. State and local governments are tasked with staying ahead of the transportation needs of a swelling residential population and a year-round flood of tourists. As part of these efforts, the remaking of the Greater Orlando highway system continues with ongoing improvements to the intersection of State Routes 417 and 408. It's one of the most heavily traveled interchanges in central Florida, bringing together two major routes and serving 300,000 vehicles each day. Linking northeast Orlando and downtown, the interchange also connects Seminole County and East Orange County to downtown Orlando, providing a direct route to the Orlando International Airport from the north and offering alternative access to the area's tourist attractions. 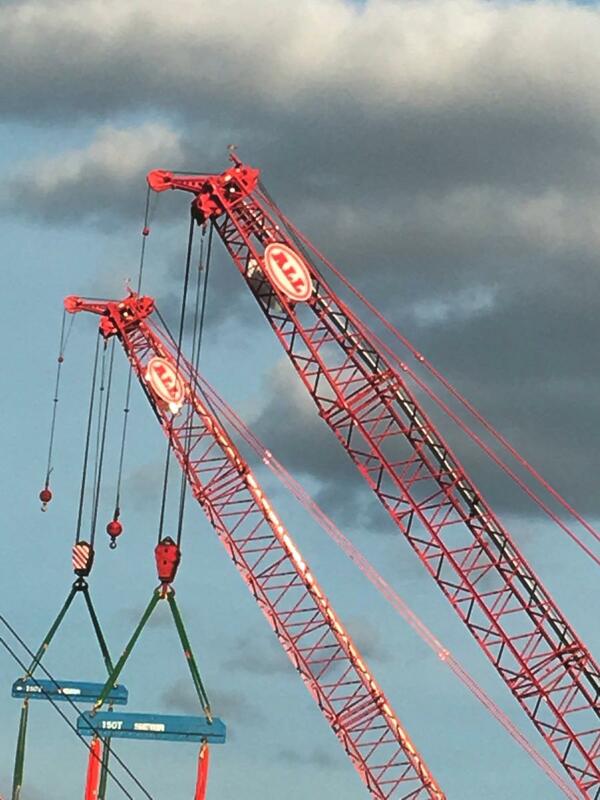 SEMA Construction, Inc., received the contract from the state for the $63 million project and tapped ALL Sunshine Crane Rental LLC, a member of the ALL Family of Companies, to provide cranes. The job is a major one, as it requires crews to build new and realigned ramps from westbound SR 408 to southbound SR 417, northbound SR 417 to westbound SR 408, and eastbound SR 408 to southbound SR 417. ALL Sunshine Crane Rental provided a matched pair of Manitowoc 2250 crawler cranes to perform the dual picks necessary to set the massive concrete U-beams that form the backbone of the new interchange. These beams can weigh up to 430,000 lbs. each and measure 160 ft. long. "It's a job in which every lift is a critical lift," said Steve Johnson, sales and rental manager of Sunshine Crane Rental. Lifts also must be done at night to minimize daytime traffic disruptions. "It's a job in which every lift is a critical lift," said Steve Johnson, sales and rental manager of Sunshine Crane Rental. Lifts also must be done at night to minimize daytime traffic disruptions. The Manitowoc 2250 is a 300-USt capacity lattice-boom crawler. Both units for this project were specified with 170 ft. of main boom and full counterweight. The large U-beams are transported to the site on specialized trucks. To ready each beam for lifting, crews must employ spreader bars to carefully prepare for multi-point lifting. After the beam is fully rigged, the two cranes must work in tandem to lift and steady it to its final position. Depending on positioning, the cranes are required to walk some of the beams into place. Minute adjustments are made, and the cranes hold the piece aloft as it is locked down. The deliberate actions and precise movements necessary mean that sometimes just two beams can be set in a night's work. "The 2250 has a small footprint, excellent vertical reach, and high capacity, which make it ideal for this interchange project," said Johnson. "Having two on the job assures the customer of reliable, consistent, and safe performance." Various improvements to the 417/408 corridors have been ongoing since 2017, with construction expected to be complete this fall. The ALL Family of Companies is the largest privately held crane rental and sales operations in North America. Their strategically located branches have access to one of the world's largest and most modern fleets, operating under the ALL, ALT, Central, Dawes, and Jeffers names. To learn more, call 800-232-4100 or visit www.allcrane.com.